Our range of products include ss stock pot, stainless steel pineapple stock pot and stainless steel storage pot. Backed by a team of well qualified and experienced professionals, we are offering an extensive range of SS Stock Pot. Our offered products are designed by utilizing of best quality material and latest technology under the direction of adroit professionals at a highly advanced fabrication unit laced with the upgraded tools and machines. Keeping in mind modern market trends, we offer these products in various sizes according to the requirements of the clients. 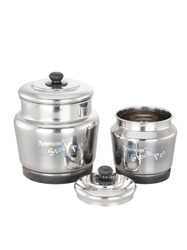 With years of industrial experience and rich knowledge in this field, we are engaged in offering quality assured array of Stainless Steel Pineapple Stock Pot for our precious patrons. The offered array is designed in accordance with the set industry norms and standards using superior quality material and pioneered technologies at well-equipped manufacturing unit. In order to ensure its quality, this product is checked by quality controller team on various quality parameters. We are one of trusted names in the industry in offering a quality approved range of Stainless Steel Storage Pot. These pots are manufactured using optimum quality basic material under the supervision of best industry experts to ensure the set industry quality norms. The offered pots are highly demanded by our clients for their eye catching designs and patterns. These products are available in different shape and sizes to fulfill the requirements of various clients at nominal market price.